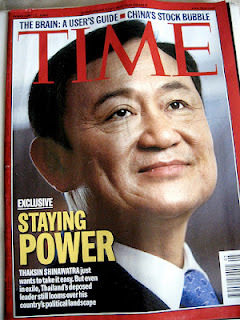 Asia Provocateur: ABAC Poll - "80.3% want Thaksin to return to fight his cases"
ABAC Poll - "80.3% want Thaksin to return to fight his cases"
This will be a brief post but a very interesting ABAC poll has been released (an analysis of the results of the poll can be found at the Thai national daily, Matichon and the Yellow Shirt-supporting, Bangkok Post). 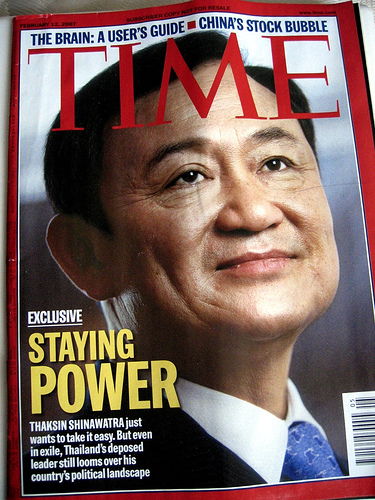 The poll covered questions such as should Thaksin return - 80.3% said he should return and "fight his cases". Obviously this result points directly to the fact that Thaksin is still incredibly relevant to Thai politics (which makes Shawn Crispin's 2008 statement that "Thaksin is finished" look even more absurd). It also alludes to some recognition that his cases should be "fought" rather than meekly accepted. The other striking bit of data was that 83.6% of those polled want Yingluck Shinawatra to continue as Prime Minister - a role she won in a landslide election victory in July 2011. These are huge numbers for both Thaksin and Yingluck, both of whom are massively popular figures in Thailand. What these numbers also reveal is that the Democrat Party, under the leadership of Abhisit, are failing to land any significant blows on the Shinawatras and the Pheu Thai party. Surely Abhisit's days as Dem Party leader are numbered?